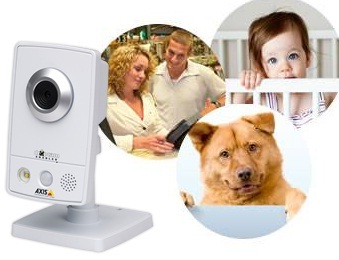 Monitoring your home is made easier with a network-enabled webcam, Dropcam. You can view footage of a surveillance area remotely on your PC or iPhone. The app can be run on two available models: Dropcam (which only captures video) and DropCam Echo (which captures video and audio). Once the Dropcam is connected to your computer, you need to register to an online Dropcam network with the password. The Wi-fi functions can then be activated and you can set up as many webcams as you like. The cameras come with a mounting accessory for easy pointing and can be placed anywhere in the surveillance area within range of the network. The audio and video quality of the Dropcam is acceptable for general surveillance purposes. The images are captured in wide-angle view with a resolution of QVGA (320 x 240). The camera even works in low light but extreme brightness or darkness will throw its functions into disarray. As such, Dropcam is mainly suitable for indoor surveillance. You cannot pan the camera remotely or enlarge the images viewed. You also cannot download screenshots, view past footage, or receive email alerts of movement unless you subscribe to the paid services. All in all, Dropcam is a simple online webcam system which allows for basic user-friendly surveillance.